Bilingual books are a wonderful aid to learning a second language and are particularly effective for toddlers and young children. They are sometimes referred to as ‘Dual Language Books’ or ‘Side-by-Side Books’ and have 2 different languages on the same page with the second language being a translation of the first, allowing the reader to compare vocabulary, language style, grammar and alphabetical characters with ease. Bilingual books have been around since the 80’s and are widely recognised as a valuable resource for parents and educators to use with children, as they provide a child-friendly bridge to reading and speaking in another language. The beauty of bilingual books is that they combine language learning with the age-old love of storytelling. What parent doesn’t love reading to their child and what child doesn’t enjoy story time!? It’s a win-win in every sense. There are many different ways to read a bilingual book and you will find the right method for you and your child. There is no right or wrong and bilingual books are there to bring the joy of storytelling to a language learning environment in a fun and interactive way. One of the most popular methods is to read the story aloud in the child’s main language first, so that they can get to know it. Treat it like any other story book and look at the pictures, talk about the story and interact with the characters. Understanding the story in the stronger language can help in the process of learning the weaker language. Go back and read the story again, this time in the second or weaker language and then again in the first language. Don’t worry if your pronunciation isn’t quite correct in the weaker language, just have fun trying it out. 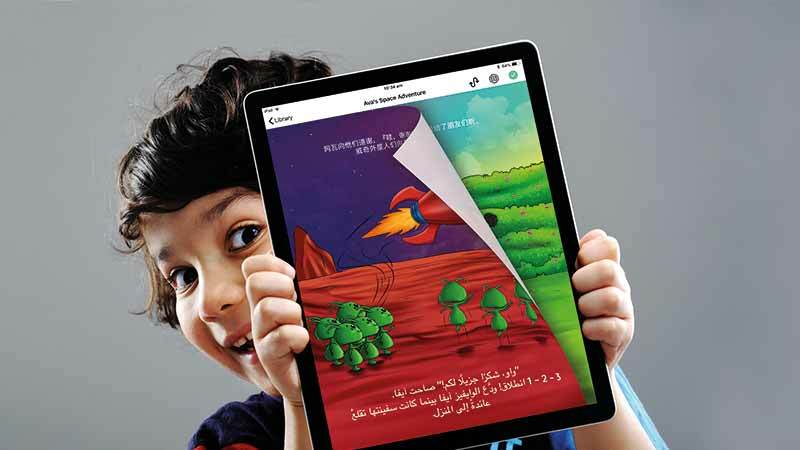 The idea is to stimulate curiosity and interest in the second language. When you think you and your child are ready, you can try reading the story in the second language only. Ask them to read it with you if they are keen to try. Above all encourage your child to have a go. Unlike adults, young children are usually not that self-conscious and this is excellent for building up confidence in a foreign language. Remember, having fun is the most important part of learning a language. Bilingual books provide a good base for this on many levels. Comparing the words, the different sounds and showing the new letters in a language’s alphabet are just a few ways to make languages fun and exciting. A bilingual book will work in any language combination and here at Unuhi we feature 20 languages which makes for a total of almost 200 different combinations. We are bringing bilingual books to as many kids as we can across the globe. For advanced learners, trying removing the weaker language and ask your child to have a go at translating into it. Then reveal Unuhi’s translation and see how they compare.2. Remove both languages and go wordless! Wordless picture books are a fun way to promote creativity and imagination. You can enjoy our illustrations, talk about what you see and even create your own story. Play games to identify the nouns, adjectives, pronouns and verbs in the stories. Randomly select a language and have fun letting another person guess which one it is. When you’re reading our flashcards, try to guess which other languages use the same word for the object you’re looking at. You might be surprised at the similarities! A designer and lover of illustrated books and father of 2 bilingual children. They both love Unuhi!